Southwest Greens a division of Shaw Industries, a Berkshire- Hathaway company, is the exclusive manufacturer of our turf grass products. All of our turf grass products are made in the USA. Out of Bound s, Inc., dba Southwest Greens of New Mexico and El Paso owned by brothers Scott and Steve Forster. Scott Forster is a Class A, PGA professional and has worked in the golf business since 1993. He was first introduced into artificial turf when working as the director of golf for Alto Lakes Golf and Country Club. Southwest Greens International was hired by Scott to install an artificial tee line on the country clubs driving range. After seeing the quality of the products and professionalism of the installation Scott started thinking of all the possibilities for artificial turf in the golf business and in private residences, “if most houses have carpet in them, why not artificial grass…outdoor carpet”. This began his journey to be part of the best synthetic turf surfaces company in the world. Steve Forster became Scott’s business partner in March of 2013. Steve having lived and worked in Rio Rancho for the last 18 years, he decided to go into business with his brother as he could see the benefits and opportunity of artificial grass in his desert community. We strive to be the consummate professional in all of our dealings with our customers. Both born and raised in New Mexico we were surrounded by many hard working New Mexicans, who taught us to have a work ethic that is rivaled by few. We believe in making long lasting professional relationships, which are nurtured out of our commitment to excellence. We continue to learn that integrity, honesty, and a good work ethic is appreciated by all of our customers and it is something we strive for every day. As a dealer of Southwest putting greens international, we are fortunate to be able to draw upon the assistance of other successful dealers for advice, labor assistance, and support so that we can do the job better than anyone else in the industry, with the best products in the industry. Give us the opportunity to install your next artificial turf surface today! We are committed to providing the best products, services, designs and installations in the synthetic grass industry. Thank you for your interest in Southwest Greens of New Mexico. Steve Forster was born in Albuquerque and raised in Socorro, New Mexico. Steve graduated with a degree in hotel and restaurant management from New Mexico State University in 1993. He worked for Taco Bell for several years running locations in the Espanola and Santa Fe areas. After leaving Taco Bell he started working at Sprint as a team director for customer relations, for 13 years. He was very successful within the organization and was promoted within quickly, however it was not his true calling. It was always his passion to be in business with his brother and when the opportunity became available in the artificial turf business he jumped right in head first. 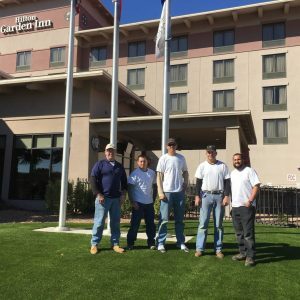 He now has experienced traveling all over Albuquerque, Rio Rancho, Santa Fe and Los Alamos , as he works to put Southwest Greens artificial turf all over New Mexico, occasionally traveling to Texas to work on other projects. Scott Forster, born in Albuquerque New Mexico, was raised in Socorro New Mexico. Scott started playing golf around the age of 6 years old, which he continued that into playing golf for the New Mexico State University golf team, where he graduated with a B.S. degree in business with a major in marketing and professional golf management. Scott worked as a PGA pro intern at several golf courses before landing the job assistant golf professional at Alto Lakes and Country Club in 1991 till 1993 when he became head golf professional, which he held until 1996. In 1996 he became the director of golf for Alto until 2002, when he decided to go into business installing Southwest Greens Artificial grass and Artificial Putting Greens into homes and businesses across New Mexico and West Texas. Scott’s favorite part about artificial grass is getting to see the dramatic change that occurs when turf is installed and getting to see the excitement of the clients when they see the change. Jonathan Cordova born in Albuquerque New Mexico and was raised all over the world, the most being in New Mexico. Jonathan was raised on a golf course with his dad, uncles, grandfather, and him being golf course shapers. Having been raised building golf courses you would imagine he would play golf, he does now but only really started in 2013. Jonathan has worked for SWGNM since 2012, alongside Southwest Greens since 2010, when SWGNM went to work on the Top of the Rock driving range in Missouri. When he ran out of shaping work he came to work for us on the continued the installation and maintenance of artificial turf on the Top of the Rock driving range. He continued to run things in Missouri as Scott and Steve took care of business back in New Mexico. In 2015 he returned to New Mexico to continue working for us as work in Missouri had ended. His favorite part about working doing artificial grass is when he has to test out the putting greens to make sure they roll properly.